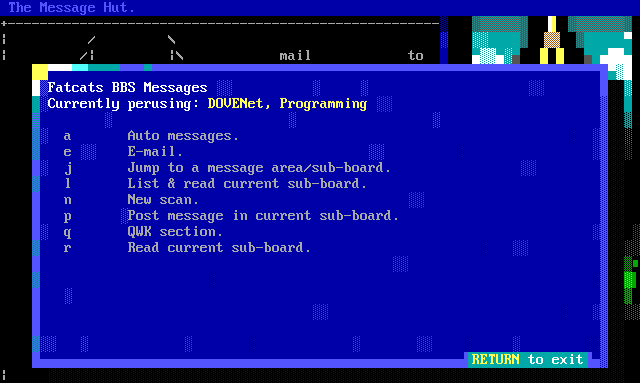 MOTD, ye olde message of the day. fTelnet, telnet to fatcats from the interwebs! SyncHack, the MMORPG roguelike BBS shell. ScienceNet, BBS message network for science enthusiasts. ░█▒▄░▐▒██░▌░▄▌▒▒▓▄▄■░░▄▄■        multiplayer BBS in existence. ░▄▄ ▀▒░░▄▒ ▀ ▀░░▒▓▌▄ ▄▀  ░▌      ■ ScienceNet hub. ▐░▌░▀▀░ ▐░▀▀▀▀▌e a  ▒▓ ▄▄▄▄           a shitload of custom code! All new users are welcome, and registration takes moments. See you on Fatcats! called FatFish, check it out in Doors > Games. It's got interBBS scores, random lakes and AI!